Just 1 Car Mat! Yes, You Can Buy Just 1 Mat from ExactMat! ExactMat Car Mat at Bat! ExactMat Car Mat Man comes up to bat. Your car’s bases are already loaded with some really nice, plush, carpeted floor mats. But you keep getting the driver side car mat muddy and greasy. You throw a pitch to ExactMat Man. 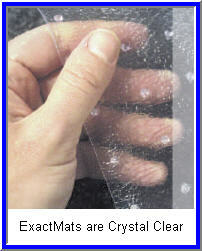 ExactMat Man hits a single and bing-bang you have 1 crystal clear virgin vinyl car mat that exactly fits over the top of your factory carpeted mat. You don’t have to buy 2 mats or 4 mats or that set that includes a cargo/trunk mat. Just pay for what you need. What a novel idea from ExactMat! ExactMats clear car floor mats protect your cars expensive carpeted mats from oil, grease, wear and tear, and all the other junk you bring in to your car on your feet. They are made of 80 mil, 100% clear virgin vinyl. Almost like looking through glass! The surface of these mats uses a pebbled pattern to give you better traction, while the bottom of the mats has some mighty sharp nibs to dig into the carpeting and prevent slippage. 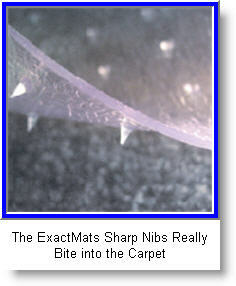 ExactMats even includes 2 “mat clamps” to improve the grip their mat has on your cars plush carpeted mats. Exact Mat Car Mat - You Can Buy Just One ! Use universal absorbent car mat protectors to keep surface water and gunk off your shoes and prevent surface runoff from getting between your fantastic ExactMats and your vehicles' carpeting. That could allow mold and mildew to grow and create a "smell" problem.